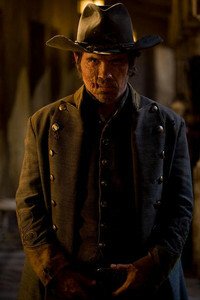 With his leathery scowl and brusque comportment, Josh Brolin seems a natural fit in the Wild West as a whiskey-soaked gunslinger in the unforgiving tradition of Jonah Hex, an ex-Confederate soldier out to avenge the murder of his wife and child. But he, like Hex, deserves a sturdier vehicle than this. Despite never resonating with readers like the company’s most iconic heroes, Hex has been an on-again, off-again member of the DC Comics universe for nearly four decades. His reward is roughly 80 minutes of screen time in which we learn the origin of his hideous scars and his notoriously quick trigger finger. Accused of betraying his fellow Rebels — his refusal to torch hospitals and churches is regarded as treason — Hex is forced to watch as deranged General Quentin Turnbull (John Malkovich) sets his family ablaze. Branded with the mark of a deserter, he’s abandoned to die, but Native Americans revive him, leaving him trapped, not unlike Keith Richards, between life and the hereafter. What betrays the otherwise unsinkable Hex is the irritating weightlessness of his story, which unfolds haphazardly and without a shred of suspense. Neither Jimmy Hayward, who previously directed Horton Hears a Who! (2008), nor screenwriters Mark Neveldine and Brian Taylor seem interested in developing any of the characters on screen. 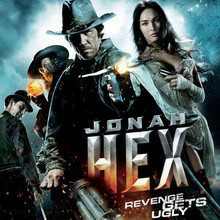 Hex is a surly thug, long on snappy one-liners but short on insight; his enemies are similarly impenetrable. They exist only to do what he won’t — that is, die. Besides his talent for postmortem conversation, Hex’s only superpower is his ability to stay alive — pumped full of bullets, his face and chest a battered testament to hard living, he boasts (albeit with a sort of weary resignation) that he can’t be killed. In Jonah Hex, the filmmakers take their best shot, but even as our hero limps defiantly into the sunset, one can’t help wondering if we’ve really seen the last of him.